Will YOU ride for food? 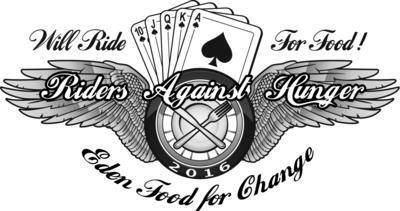 The 6th annual RAH is a charity motorcycle ride in support of Eden Food for Change; providing food and skills training to hungry families in western Mississauga. The ride follows a signed, 3-4 hour scenic route with designated ride stops. Breakfast is provided during registration with lunch and live music after the ride. Prizes awarded for best hand, grand-prize draw, and top three fundraisers. Registration: $35 for basic registration, $50 includes ride t-shirt and draw ticket. Ride for FREE by collecting a minimum of $35 in donations. Raise additional funds for incentive gifts and prizes.